A court in Cambodia’s capital Phnom Penh on Thursday released five rights defenders from prison after more than a year in pre-trial detention on charges widely seen as politically motivated, drawing praise from one of their lawyers who called for the cases to be dropped. ADHOC officials Lim Mony, Ny Sokha, Yi Soksan, and Nay Vanda, and National Election Committee (NEC) deputy secretary-general Ny Chakrya, had been held for 427 days at Prey Sar and PJ prisons amid a wide-ranging probe into a purported affair by opposition Cambodia National Rescue Party (CNRP) president Kem Sokha. On Thursday evening, Phnom Penh Municipal Court Judge Theam Chan Piseth concluded his investigation and issued a court order to send their case to trial, conditionally freeing the five from detention and placing them under court supervision. According to the ruling, the five cannot change their residence or leave the country without court permission and must answer to any court summons. Following their release, the former detainees traveled to a nearby temple, where a Buddhist monk performed a cleansing ceremony to “wash away all evil.” The four active ADHOC officials then gathered at their organization’s office for an hour before returning to their homes. 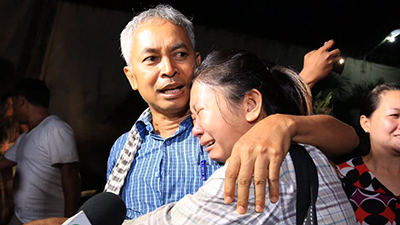 Ny Chakrya’s lawyer Som Sokong told RFA’s Khmer Service that he welcomed the provisional release of the ADHOC 5, but said the court should have thrown out their cases. “We are not satisfied with the court for not dropping all charges against them,” he said. Speaking to RFA after his release, Ny Sokha said that despite the hardships of his time in prison, he was encouraged by the support he and the other four detainees received from the local and international community, adding that he is committed to continue campaigning for human rights. “Even as a human rights defender, I was still badly mistreated, so I cannot imagine how ordinary people would have been treated,” he said. Yi Sokan said he was surprised by the court’s decision to release him and the other four detainees, and echoed Ny Sokha’s vow to return to rights work. “I will continue to do my work to advocate for basic rights and freedoms for my people,” he said. Lim Mony said that her passion is fighting for the rights of women and children, which she has done for some 20 years and will continue to do. “I have never committed any wrongdoing,” she said, adding that she had strictly followed ADHOC’s policies and principles while working as a rights defender. Nay Vanda thanked the media for its coverage of his case, as well as NGOs and local supporters for pushing for the release of the ADHOC 5, while Ny Chakrya pledged to return to his work at the NEC as soon as possible. 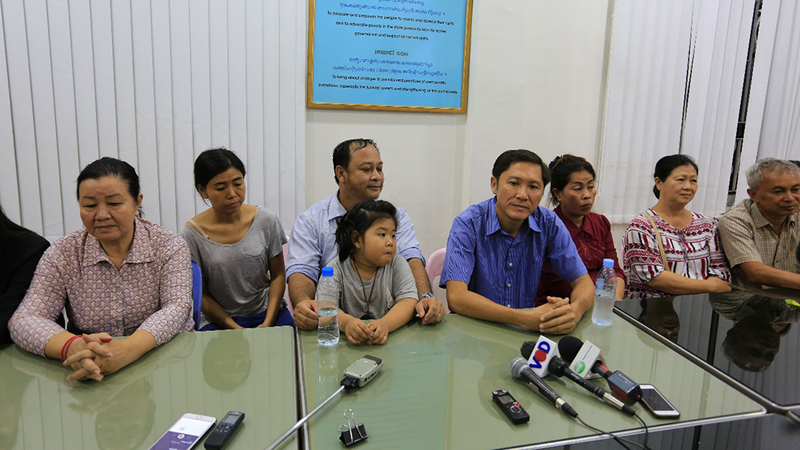 ADHOC director Thun Saray, who fled to Canada last fall amid the charges against his four colleagues, told RFA he was pleased to learn that they had been released, but added that a provisional release was not enough to bring them and Ny Chakrya justice. “Unless all charges against them are dropped, their freedom to travel abroad will still be restricted and their activities will be limited,” he said. Thun Saray said that the cases against the ADHOC 5 show that “there is still a long road towards democracy” for Cambodia. “Even the [June 4] commune election had a lot of shortcomings, so there is a serious need for more efforts to improve democracy and human rights [in the country],” he said. The case against the ADHOC 5 has been widely dismissed as politically motivated, and has drawn condemnation from rights groups and the United Nations. In response to an April court ruling to extend the pre-trial detention of the ADHOC 5, the United Nations Human Rights Office of the High Commissioner (OHCHR) called for Cambodian Prime Minister Hun Sen’s government to “release without delay” the five rights defenders, while the U.N. Working Group on Arbitrary Detention recommended last November that they be freed. On April 26, the detainees were collectively named as a finalist for the 2017 Martin Ennals Award, which provides protection and support to human rights defenders deemed at risk. The award will be presented on Oct. 10 in Geneva. Also on Thursday, Cambodia’s Appeals Court upheld a lower court ruling which sentenced CNRP parliamentarian Hong Sok Hour to seven years in prison for incitement last year. Hong Sok Hour’s lawyer Choung Chou Ngy called the decision “unfair” and slammed the court for failing to assign experts to investigate his case, adding that he plans to appeal. Hong Sok Hour has been held at Prey Sar Prison since his arrest on Aug. 15, 2015. Reported by Vuthy Tha, Maly Leng and Thai Tha for RFA’s Khmer Service. Translated by Nareth Muong. Written in English by Joshua Lipes.